As detailed in the article The Birth of Commercial Aviation, the first successful airlines in the United States emerged from the Contract Air Mail (CAM) carriers established by the U.S. government and Postal Service that began operations in 1926. Turning the tide on a trend of failed ventures in early U.S. passenger air travel, the first airline to break through to economic success would be the original operator of “mail route no. 4” (CAM-4), Western Air Express (which would eventually become Western Airlines before joining the Delta family in 1986). Western Air Express’s success would be followed by that of other CAM carriers, many of whom would also go on to become major players in the airline industry including CAM-5 carrier Varney Airlines (which would later be acquired by Boeing and eventually merged with United Airlines) and CAM-2 carrier Robertson Aircraft Corporation with chief pilot Charles Lindbergh (which would become American Airlines, currently the largest airline in the world). On January 1, 1914, a decade after Orville and Wilbur Wright made their historic first flights at Kitty Hawk, N.C., a two seat flying boat built by Thomas Benoist and piloted by Antony H. Jannus flew the 18 mile trip from St. Petersburg to Tampa, Florida carrying its first passenger, former St. Petersburg Mayor Abe Pheil. Though rarely exceeding an altitude of 5 feet above the water, the flying boat reduced the time of the otherwise 2 hour boat trip to 23 minutes. The St. Petersburg-Tampa Airboat Line would go on to fly two flights per day for the next four months, though the company would go out of business after four months of operation. Starting ad-hoc charter operations as the Red Arrow Flying Service it would take on various names until becoming Chalk’s International Airlines. It operated scheduled seaplane services from Florida to the Bahamas, and during Prohibition was a major source of alcohol smuggled from the Bahamas to the United States. In fact, many of the most prominent gangsters of the era used Chalk’s, including Al Capone. Unlike most of the other operators of this era who would go out of business after only a few years (or in many cases a few months) of operation, Chalk’s bankruptcy would come years later when the United States Department of Transportation revoked its flying charter in 2007. Flew surplus wartime flying boats between New York and Atlantic City. It is not known when it officially went out of business. Flew between Miami and the British island of Bimimi. Soon after the Armistice, American Trans-Oceanic Co. rebuilt a number of Curtiss H.S. and H.-16 Flying Boats into passenger machines, some of which were capable of carrying up to 14 to 16 passengers. The company would go out of business shortly after its founder Rodman Wanamaker died in May 1928. Started by Syd Chaplin, half brother of Charlie Chaplin, this airline flew passengers in Curtiss MF flying boats between Los Angeles and Catalina Island briefly in 1919. Started by successful motion pictures director Cecil B DeMille, Mercury Aviation Company provided scheduled airboat service to Santa Catalina Island, San Diego, and later San Francisco, among a few other smaller destinations. There is even evidence that would indicate Mercury flew some passengers in landplanes (Junker-Larsen JL-6 monoplanes) in California in the mid-1920s, though it would not remain in business long enough to establish year-round scheduled routes. A short-lived operation started by Arthur Rosenthal and Thomas Swift carrying passengers and light freight to Ionia, Michigan in Curtiss JN-4s in 1920. The same year it would end passenger service operation, returning to barnstorming and teaching flying. In 1920, entrepreneur Inglis Uppercu began offering international passenger flights aboard flying boats from Key West, Florida, to Havana, Cuba, and would later add additional routes. The overseas flights were a popular way for many to drink legally during the Prohibition era. Aeromarine Airways would go on to boast of many “firsts” – the first U.S. international air mail service and first scheduled U.S. international passenger service (Key West to Havana, November 1, 1920); first total service U.S. airline (passenger, mail, express cargo); first in-flight movie (Chicago, August 1921); first airline baggage label (1921); and the first U.S. airline ticket office (Cleveland, July 1922). The airline would go out of business though in 1924 after one of its planes crashed off the coast of Florida. Beginning service in 1922 using two war surplus Curtiss HS-2L flying boats, this airline operated between Los Angeles and Catalina Island. In June 1928, Western Air Express took over the operations of the company, and used new Loening amphibians in operating from Vail Field in Los Angeles, retiring the old HS-2Ls that had seen continuous service since 1922. Western would sell the company in 1932, and the Wrigley family would then operate the flying boats for a short time after that. Grover Loening, an early aircraft manufacturer, launched the New York – Newport Air Service using three, 4-person Loening 23L Air Yaghts to carry socially and financially prominent people to the fashionable Rhode Island port. Early in 1923, however, the operation ended after one of the Air Yaghts crashed. The Gulf Coast Air Line flew from New Orleans to Pilottown, at the tip of the Mississippi Delta beginning in 1923. It provided a mail link with steamers traveling to or from Cuba, the Caribbean, and Central and South America. It would not survive though the date it went out of business is unknown. Using Curtis HS-2L flying boats, this airline flew a short time between New York and Fire Island, on the southern shore of Long Island. It was the first to use the Commuter name, which would become a common term a half century later. Beginning a regular passenger service from San Diego to Los Angeles on March 1, 1925, flying 5-seat Standard biplanes (and later upgraded to 11-seat Douglas Cloudsters), this was one of the first significant overland airline operations in the U.S. Ryan is reported to have carried 5,600 passengers, even though the company and its passenger service would be phased out the same year in favor of other business interests such as airplane manufacturing. In fact, it was in that arena that it would make arguably its greatest contribution, as founder T. Claude Ryan’s plane design, M-1, evolved into the Spirit of St. Louis for Charles Lindbergh’s famous flight. (Click here to see the first ticket issued on Western Air Express, which today through the Delta family tree of airlines remains the oldest passenger ticket of surviving legacy in the U.S.). 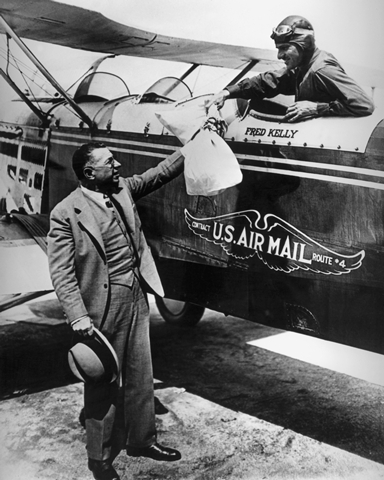 Western Air Express Founder Harris “Pop” Hanshue hands mail bag to WAE pilot Fred Kelly.